Making use of composites in the body changes the traditional way of thinking about automotive manufacturing. Rather than looking at large scale factories with huge investments we work with much smaller investments and small, distributed factories. We are therefore proud to announce that we now to see the effect of the last 12 months intense work in creating the first Micro-Factory in India! We are now in a position where we would like to reveal some details to our audience, regards our work of implementing our manufacturing strategy. Our aim to scaling up the production in India to 10.000 vehicles in three years is very much becoming a reality and the plan is to already next year have a 3.000 unit capacity from the first factory. We´ve been optimizing the factory using Siemens PLM software and the “Digital Twin” of the upcoming factory to define and simulate different flows and layouts. In May we announced that we´d partnered up with Siemens on creating this efficient and digital concept. The primary principle of the Micro-Factory has been part of the business plan already from the inception of the company and has been part of the development all the way. A lot of separate projects, like the FFI-project* to enable a rational production process, has provided input so that we can pull off this rapid ramp up in India. 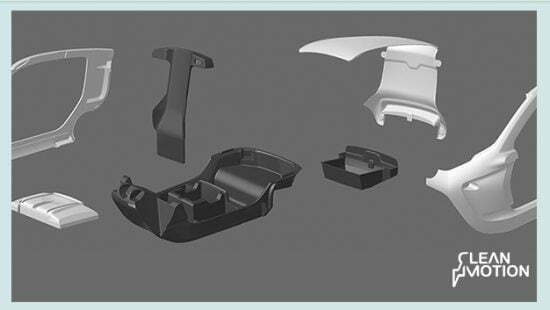 Using Fiber Reinforced Plastics (FRP- composites) is dramatically different from a steel or aluminum design. Traditional automotive companies have enormous investments in equipment and tools but thanks to extreme mass production the cost per vehicle becomes acceptable. For composites the equation looks entirely opposite. The investments in equipment and tooling are very low but the scalability is also more limited. Using Vacuum infusion technology, we believe, is not feasible to increase production to traditional automotive volumes in one factory. Rather than planning for a large scale factory our intentions has always been to produce in small plants that are situated close to the end customers. In Sweden we have our fully certified Master-Factory in Trollhättan, with a local capacity of 1 000 vehicles per year. However, the Master-Factory is mainly intended as a proving ground for future models, pre-series, testing and staff training. It is the heart of our global production process and planned Micro-Factory Network. In parallel with the physical factory we have started to build our Virtual Factory, which is a so called Digital Twin of the Master-Factory. The Virtual Factory is helping us in our future production development, testing and optimization. This enables us to early in the process, test and optimize product, processes and resources with short lead-time in the virtual world, it ensure quick physical implementation. In India, we have so far assembled Zbee locally in our location in Faridabad, south of New Delhi, to enable the deployment of Zbee in our India clusters. This has worked out fine and given us valuable experience and feedback but as the demand is extremely high, our ambition to scale up has to be much more rapid then we expected. We have therefore moved our preemies and our new factory which is now located in what is called Greater Noida, and this will become our first fully functioning Micro-Factory starting the production next year. Sunil Patil who has quite recently joined as our Manufacturing Director in India are busy getting the suppliers in as well as recruiting staff for this new facility. Guest Writer: Jen from Siemens!